If you’re having issues as I am with rabbits eating your yard, I would like to suggest plants the rabbits don’t eat. My first pick is alyssum. They are a nice border plant and will sometimes survive a mild winter. Their white color blends with most other flowering plants. Lantana comes next. It is available in nice colors from yellow to orange to red to purple. The purple lantana is a smaller growing plant. Lantana must be cut back once a year in February. Butterflies and hummingbirds love the flowers. Next are geraniums. They are great. I grow them in pots and the bunnies are not attracted to them. I like to have the pots under a tree with filtered light from the leaves. You also can place them where they get shade in the afternoon. Geraniums can last for many years when you cut them back in the early spring. Summer-flowering Vinca is a good plant, too. It should be available in the nurseries soon. I like the white ones with red centers, but there are other colors to choose from. Snapdragons are good choices for fall and spring. They don’t do well in the heat. If you dead-head them (cut off the spent flowers) you will get a longer bloom. Salvia is a great choice in Las Vegas. It comes in various colors. I have the salvia “Blue Victoria” that winters over in pots and in the ground. Salvia doesn’t get too tall, 18 to 24 inches, and makes a nice background for a small flower bed. These are bedding plants you can get at the nursery. Another rabbit-proof plant is California poppies. I scatter them in the rock mulch and they are a real harbinger of spring when they are spectacular. Wild flower seeds produce plants that beautify your yard with much less work. Seed packets may be purchased on the Internet. 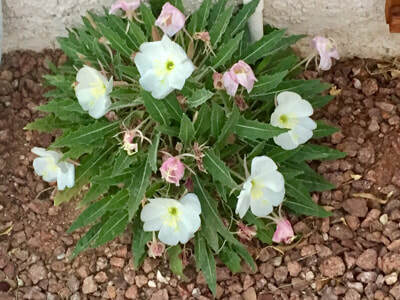 I have hundreds of penstemons growing in my yard, which were grown from seed and scattered on the rock mulch covering the yard. They are pink, red and yellow. They can be purchased in pots at the nursery and look best in masses. I don’t do much, just an occasional watering by hand. We love the look and so do the hummers – they are visiting us in droves. They self-sow. You will have more next year, as well. Native plants from the nursery include Blackfoot daisy, which will self-sow but is not invasive. Also available in pots is Damianita. It is a 1 to 2-foot, bushy, low-growing, aromatic, evergreen shrub with stems rising in a mounded form from a woody base. It has vibrant yellow flowers and deep forest green foliage. It grows very low to the ground. Spring is just around the corner. By now you should have trimmed back your roses, had your trees pruned by a certified arborist and cut back your lantana. Roses should be cut back to about 12 to 18 inches and all the small branches cut off, the leaves picked and a little fertilizer put down near the roots. Lantana should be cut back to 8 inches or so. I had one specimen, planted in 2000, that gets cut back very hard every spring. That plant gets 15 feet across in the summer. It is the variety called Radiation. When I see lantana planted 2 feet or less from the sidewalk, I think the person who planted it didn’t know the growth habit of this vigorous plant. It’s better to only prune them once a year and occasionally if they grow into a walkway. This is a good time to put a little fertilizer on all your blooming plants. I personally like to use palm food on almost everything. It has a little Epsom salts (which is magnesium sulfate) and iron. If you have star jasmine, this is the time to give it a dose of Epsom salts, chelated iron (sold as Kerex) and soil sulfur. You must use the soil sulfur with the Kerex. It will cure those yellow leaves on your plant. This is a good time to evaluate your irrigation system for leaks. Turn the water on and walk your yard. It is easier to make repairs when it is cooler. If you’re gray-haired like me, it’s not so much fun when it gets hot outside. A Sun City resident has free canna tubers for the asking. Please email dyhawley@gmail.com if you are interested. We had the pleasure of going to India in January. It was interesting to see plants that grow there that also grow in Las Vegas. You may enjoy a few pictures from this trip. Here is the foxtail fern, commonly used in pots and shady places in the garden. Where ever you came from when you moved to Las Vegas, you did not expect the soil we have. Most soil in the United States has 3 percent to 5 percent organic matter. I have been told our soil has .1 percent organic matter. Other places have rain; we have very little – .4 inches a year on average. Our irrigation water comes from the Colorado River and is very salty. One foot acre of water contains 1 ton of salt, about 244,000 gallons. Those white crusts you see around your emitters is salt. The only way to get rid of the salt accumulation is to leach it out with more water. Periodically, you should run your irrigation system several cycles to leach the salts. When it rains, that is the best way to wash the salts out of the soil. I have been told there are 160 soil types in this valley. My experience is only in the northwestern part of the valley, so I’ll tell you what I have experienced. Our soils are very alkaline. The pH is high so many plants suffer from deficiencies of iron, zinc, manganese. The high pH inhibits normal plant growth. Iron deficiencies are called iron chlorosis. The space between the veins is whitish and the veins are green. Zinc deficiencies cause the young leaves to be pale or yellowish. Manganese deficiency shows as young leaves being mottled. Adding soil sulfur about three times a year is easy; it doesn’t fix everything, but it does lower the pH. Adding organic matter also helps. Just sprinkle it around the root ball and water it in. It takes a while to break down and be absorbed by the plant. When a plant is established, you can use organic mulches to keep moisture in the root area and as it decomposes, it will add some nutrients to the soil as well. Most plants don’t need too much fertilizer, but I generally like a fertilizer that has Epson salts in it. Epson salts add a bit of magnesium to the soil; you don’t need a lot. Understand, you aren’t going to make the soil any better, but proper plant selection and good watering practices will help your landscape thrive. Write to me at desertgardener@gmail.com if you have questions. Top left, blue gamma; right, fountain grass. Let’s talk about ornamental grasses that beautify your yard and are easy to care for. One grass that I see is the white fountain grass (Pennisetum setaceum). It is in yards and in public areas in Sun City. This is a grass you do not want in your landscape. observed escaping cultivation, and could become a serious weed in natural areas. There has been an initiative to remove it in Clark County. Other grasses I have experienced that I don’t recommend are Mexican feather grass and Purple Three Awn Grass. They are both invasive. That being said, let’s look at some of the lovely grasses that are available for your yard. Muhlenbergia emersleyi, “El Toro.” It is a clump grass that is extremely drought tolerant and sends up masses of rosey-purple flower spikes in the fall. They dry to a tan color in the winter. Muhlenbergia lindheimeri, “Autumn Glow.” It has tall spikes of light yellow flowers in the fall. Plant in full sun, reflected heat or part shade. Muhlenbergia capillaris, “Regal Mist.” It is a small clump grass with narrow, glossy green leaves. In the fall, it has deep pink flowers that are spectacular in the afternoon when the light shines through them. This grass needs ample irrigation in the summer. My favorite grass is Bouteloua gracilis, “Blue Gramma.” The seed heads look like little eyebrows. They appear in the summer, the leaves are light green. This is one of the best grasses for the arid west. They are ideal for containers. Every savvy gardener knows that ornamental grasses are radiant when backlit by the sun in the early morning or late afternoon hours. Well-placed grasses capture the wind and provide dramatic movement in the landscape. Grasses add softness to the desert landscape. Grasses can be excellent in containers. When you plant grasses, consider planting them in groups of uneven numbers, 3, 5, 7, etc. Remember, do not cut your grasses down until the middle of February. Then cut them down to 2”. Too many gardeners cut off the seed heads in the fall and that is the beauty of grasses in the landscape. They add interest to the landscape during the winter months. A lot of plants are being scalped right now and it’s way too early to do this pruning. Do all your pruning in February – trees, grasses and roses. Fertilize them and they will be starting the growing season in a few weeks. Another favorite plant of mine is called Mexican grass tree (Dasylirion Quadrangulatum, Longissimum). It is not a grass, though. It is actually related to the desert spoon, cousins more or less. This is a medium to large plant over time. It has stiff leaves that move in the wind. They are circular in appearance and after 17 years, mine is about 5.5 feet tall and about 8 feet wide. They do need room to grow. I consider this an architectural plant – very stunning and eye catching. It does not have the recurved spines of the desert spoon. By the way, don’t prune the desert spoon, it makes them look like ugly pineapples. Left, Clivia offers stunning blooms and foliage that lasts all year round. Right, purple stock is very fragrant . Plants in pots are a great way to brighten up spots in your yard. This little cactus was a gift from my pet sitter. It has had up to 50 flowers on it in one day. Granted, they only last for a day but your patience in caring for these plants is rewarded. Generally, I use annuals in pots under trees or in other areas where there is a bit of shade, such as the front porch. A spot of color is a lovely way to greet your guests as they ring the doorbell. I have had much success with geraniums, they can last years. They really aren’t geraniums, they are technically pelargoniums. If you cut them back in late winter, the plants will come back very quickly. They are easy to find at most garden centers and come in a great variety of colors. I like to get pots that are a bit taller than a rabbit can reach. I found a nice selection of pots last year at Little Baja. It’s a short drive to see hundreds of pots. Of course, all the local home centers and garden centers have pots as well. Shorter-lived plants or annuals are stock, snapdragons, vinca and Angelonia are all good choices. Salvia is another great option. It flowers in shades of red, blue, white, salmon, pink and bicolor, and the plants are anywhere from 8 to 24 inches tall. White Alyssum works very well around the perimeter of the pot with some colored plants in the center. You can either put an emitter in each pot or hand water. I actually enjoy hand watering as it is a soothing time to enjoy your yard. I am enjoying a more unusual plant in our house that I surprisingly found at Home Depot. It is called Clivia. It can be kept outdoors in the shade in summer and brought inside near a window in winter. I was fortunate enough to see this plant in the wild in South Africa last year. 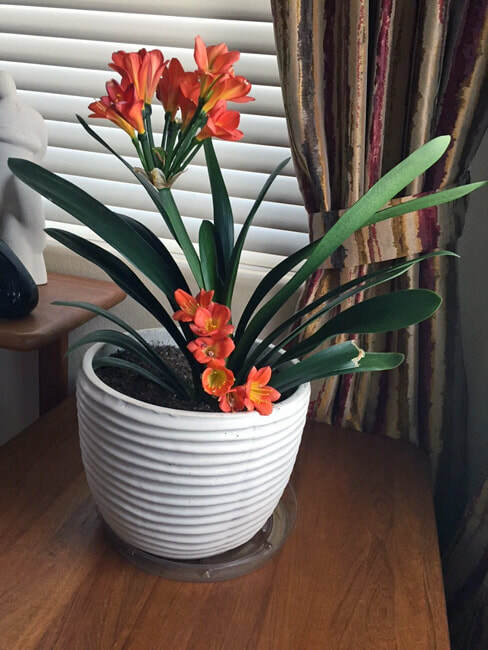 My friend in Indiana has her grandmother’s Clivia. That plant is over 70 years old. Clivia likes to be somewhat dry, so they don’t need watering more than once a week. I do use a $9 moisture meter to check all my house plants. The attraction to Clivia plants can be found in their stunning blooms, which vary in color from pale orange to red. The fragrant, trumpet-like flowers are similar to that of amaryllis but smaller. Unlike the amaryllis, Clivia retains its foliage year round. Read more at “Gardening Know How: Growing Clivia – Care For Clivia Plant” at https://www.gardeningknowhow.com/ornamental/flowers/clivia/clivia-plant.htm. This is the time of year I begin planning for next year. I’m planting garlic in my little raised bed vegetable garden in the back yard. It will grow through the winter and next June or so, when the tops start to dry out, I will have a small crop of garlic. I also like to scatter some California poppy seeds in the yard. They light up in the spring and give you a huge show. Blanket flower or gaillardia will make a nice show for a very long time. They also are very easy to grow. I really don’t do much, just scatter them in the gravel in the yard. I like that natural look. But if you like a more orderly look, you can choose an area that will give you an accent and a great spot of color. I love purple phacelia (Phacelia companularia) and have actually bought seeds from Amazon. The plants are very low growing and suitable along walkways, so visitors may enjoy them. There are Websites that offer these varieties; you will be surprised how easy it is to grow them. I have had great success with yellow columbine, they grow in semi-sunny conditions. If you allow it, they will naturalize in filtered light and put on a great spring show and a smaller fall show. They require some trimming but nothing like real work. I originally bought them from High Country Gardens, a mail order company in New Mexico. Since I have so many problems with rabbits, I would like to include some rabbit-resistant plants. Society garlic has a nice purple flower. Artemesia, the variety I like most, is Powis Castle Artemisia. Dusty Miller has a nice gray foliage variation. Penstemons come in various colors. I like red and pink. Nasturtium, I just planted some, most likely will sprout and winter over, guaranteeing me some early spring color. They are great in pots or in the ground. The various sages are also rabbit resistant. A tip: If you crush a leaf and it has a pungent smell, it is a salvia or sage. Plants called sage can fool us, such as Texas Rangers. 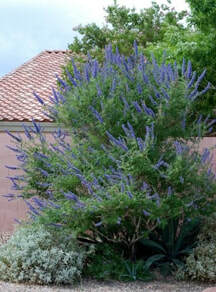 They are often called Texas sage, but they are in a different family of plants. Another good rabbit repellent plant is lantana. Do not plant it in the fall, it may not winter over. When you plant lantana, give them plenty of room. I had a Radiation lantana that grew 15 feet wide. It has been in the ground for 17 years. So believe me when I say you need to give them a lot more space. It will save you money and the plants will look more beautiful if they aren’t clipped all the time. A lovely native shrub is Salvia dorii or purple desert sage. I bought very small plants at the Las Vegas State Tree Nursery at Floyd Lamb Park, 9600 Tule Springs Road, Las Vegas. The plants are grown for conservation plantings. I say that I am buying them for water conservation. Read the website (forestry.nv.gov/ndf-state-forest-nurseries/las-vegas-state-tree-nursery) and decide for yourself. There are some nice things like globemallow and brittle bush that are very suited for our smaller yards. It may take some time to look up these plants on the Internet, but there is great reward in seeing these natives thrive in our yards. Left, cochineal scale, which is really an insect, shown on a cactus. Right, a correct cut applied to a tree during pruning shows how the tree is healing. 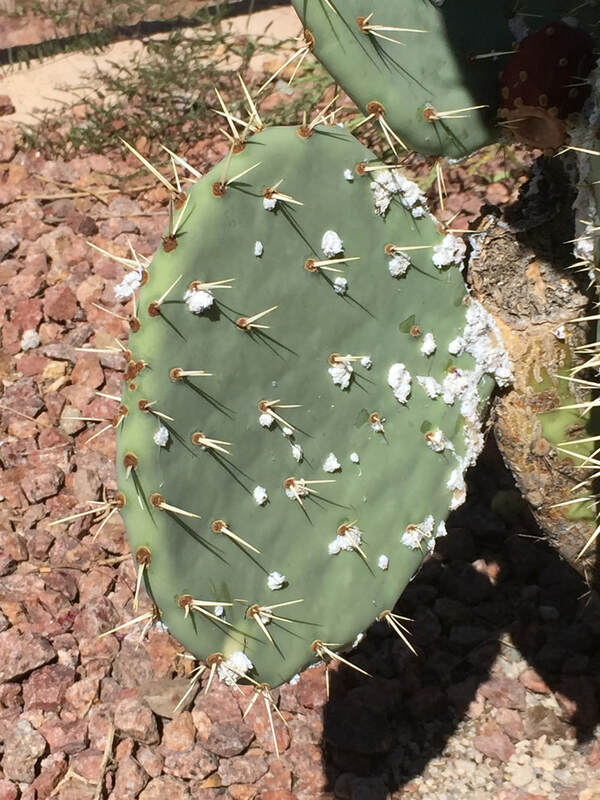 Let’s talk about a common problem I see in people’s yards – white spots on cactus pads. It’s called cochineal scale. It is actually an insect, not a fungus or scale. If you scrape off the cottony-looking mass and crush it, you’ll get a red smear. This red was used as war paint by Native Americans in the Southwest. It was once used as a red dye and in cosmetics. If the infestation of cochineal scale is large enough, it can weaken your cactus. Most often you can try washing it off with a high pressure setting on your hose. Other remedies are safer insecticidal soap, dormant oil spray or Neem oil. None are toxic to the environment. This is a good time of year to use the oil. When it’s too hot, it can damage the plant. Always be sure to read the directions of anything you decide to use on your plants and be sure to use the product as directed. I’m seeing a lot of awful tree trimming lately. Now is NOT the time to trim trees or shrubs, the appropriate time is when they are dormant in January and February. Pruning now can stimulate new growth, not a good idea before it gets cold. It can result in frostbite and other damage. I recommend hiring a certified arborist. I see stubs being left on trees. Where each branch originates, there is a collar of cells that will heal the tree, so cut a branch off about a ¼ inch where the branch grows from the original branch. The tree cannot heal itself when you leave stubs. This is how a tree looks when a ranch is cut off properly and is healing over. Even worse, is a practice called lion-tailing. That is scalping the branches and leaving all the foliage on the ends of the branches. That makes the tree top heavy and susceptible to blowing over. It is a bad practice and leaves the bark exposed to the sun, which can cause sun scald. Rule of thumb is to never remove more than 30 percent of the foliage. I recommend less. When you over-prune a tree, you get water sprouts. These are branches that shoot straight up. This is not a natural look, and the sprouts don’t add to the beauty of the tree. The other practice I see commonly is topping trees. This results in skewed branches and sprouts that come out of the stubs in an unnatural way. This is not a job for most gardeners unless they have been specifically trained to prune trees. Last, let’s look at staking a tree. The original stake that came with your tree when it was young should have been removed immediately. Then, two or three stakes should be placed 1 foot or so from the tree, about 2/3rds the height of the tree. Tie the tree to the stakes. The tree should not rub against the stakes. Use a piece of hose over the wire or rope that you are using to stake the tree, so that you don’t damage the bark. If your tree is more than 2 years old, there should not be any stakes attached to it. It should be solid. If you love plants, and bargains even better, then head to the Springs Preserves Annual Plant Sale on Saturday, 8 a.m. to 1 p.m. The event gets under way in the south parking lot (333 S. Valley View Blvd., off US-95). Hundreds of drought-tolerant plants in 1- to 15-gallon containers will be available for sale at fantastic prices. If you’re looking to change out plants, trees or shrubs in your yard, this event is a great place to start as it also offers the resource of speaking with a gardening expert, who can offer advice and professional experience. Chaste tree. Photo by Karen Luksich. Texas Mountain Laurel. Photo by Karen Luksich. Since it is quickly approaching fall planting season, I have been checking out what is available for sale in the local nurseries. Far too many plants that are for sale are not going to survive very long. We have a good desert plant palette that tolerates our salty alkaline soil. More on that later. Some of the plants to avoid are sub-tropical plants that will not winter over. Tipuana tipu and pygmy date palms are not cold tolerant. Crape myrtle, azaleas, rhododendron and other acid-loving plants will wither away. We have a high pH and low organic matter. Most soils in the U.S. have 4 to 5 percent organic matter; our soil has .1 percent. The easiest way to have a successful yard is to avoid planting things that don’t tolerate these conditions. Another plant to avoid is the purple leaf plum. They are lovely, but the most appetizing target for flat-headed borers. All over Sun City, most of the plums are infested. You can see the trees failing and many already have been replaced. I see Chitalpas being used, but they are also struggling. I planted a new (for me) shrub this year, which is growing well. It is an evergreen sumac (Rhus virens). In time it will be a large shrub, maybe 8 to 10 feet tall. I have seen them planted in front of The Summit here in Sun City and they are doing well with a western-facing location. I also saw them grown in large containers in front of the Suncoast. 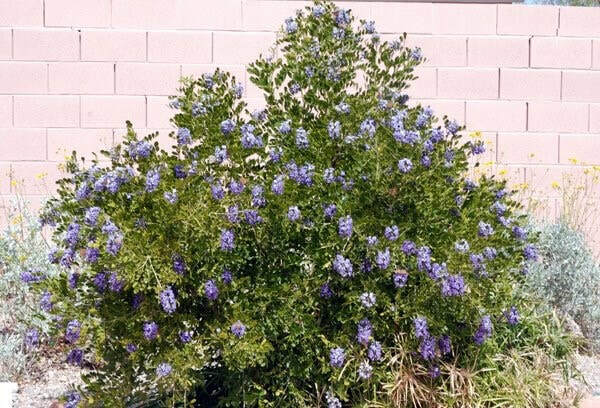 Other no-fail shrubs are Texas Rangers and Texas Mountain Laurel. Lower-growing are Dalea Sierra Gold and Trailing Indigo bush (Dalea greggii). In my walks I have noticed a lot of plants that have iron chlorosis. You can easily identify it by the pale leaves with green veins. Star jasmine is particularly susceptible and other plants are pyracantha and roses. The cure for chlorosis is to put soil sulfur and kerex on these plants three times a year. The soil sulfur lowers the pH, or makes it less alkaline; the kerex is a chelated iron that is formulated for alkaline soils. The soil sulfur is cheap, the kerex isn’t. The good thing is you don’t need much. It takes a while to get to the plant, so I sprinkle it on the ground and water it in. You can mark a reminder on your calendar to do this three times a year. The soil chemistry behind this, if you really want to know, is the high pH binds the iron in the soil so it isn’t available to the plants. Our water is very salty. Did you know that 1 foot acre of water (244,000 gallons) has 2,000 lbs. of salt in it? Salt accumulates as white crusts around your emitters. Don’t forget the plant sale at the Springs Preserve, 333 S. Valley View Blvd., on Saturday, September 16, from 8 a.m. to 1 p.m. You’ll find many nice plants that will survive the stress of the Mojave Desert. Clockwise from top, angel wing primrose, dog weed and gopher plant. Below, firecracker or Eaton's penstemmon. Well, I’m sure we all appreciate that the weather is turning just a bit cooler. It gives us time to decide on changing out some plants that have lived their natural life span. I have a major problem with rabbits. They seem to be munching on many things in my yard. Sometimes I think I am growing cages instead of plants. They seem to like the iceplant, the angelita daisies, the moss roses or portulaca and many other soft plants. They have decimated a desert mallow three times, and I keep putting a cage around it and it does grow back. I have had success with Angel Wing Primrose (Oenothera caespitosa), good for narrow spaces. It is night-blooming, fragrant and the white flowers close in late morning. Another small, long-blooming plant is dyssodia, (Dyssodia pentachaeta), or dog weed. It has small yellow flowers, blooms for about nine months and dies, but not before it spreads its seeds. It isn’t particularly invasive. A little taller is the blackfoot daisy, (Melampodium leucanthum), about 9” to 12” tall. It has white flowers with yellow centers, also a long-blooming plant. 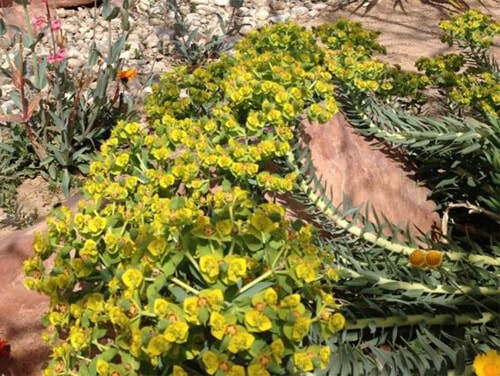 It is drought and heat tolerant, has gray-green foliage and is perennial. A plant that adds some interesting foliage is the gopher plant, (Euphorbia rigida). It has sulfurous yellow flowers very early in the spring, probably the earliest bloomer in my yard. One caution, this plant reseeds very easily. After it blooms, you want to cut back every stem that has bloomed, but you must wear gloves and keep the sap off your skin and especially away from your eyes. 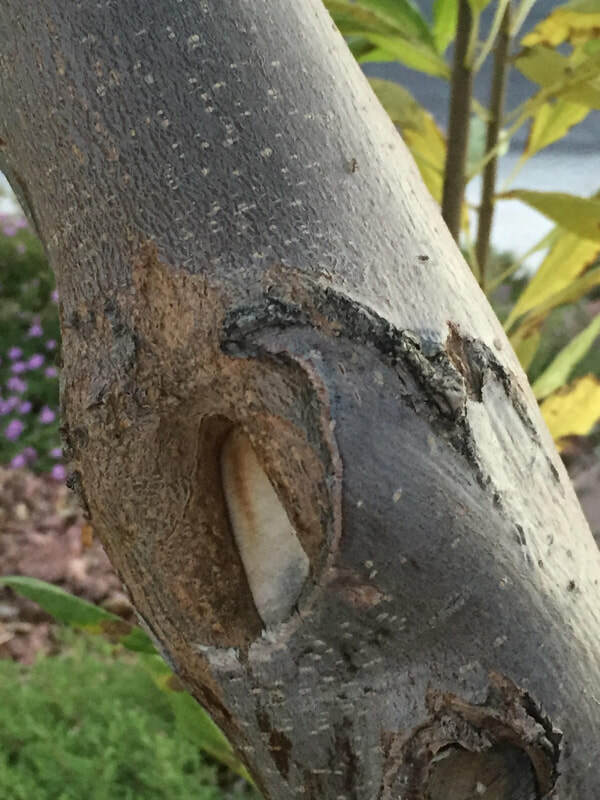 The milky looking sap is very caustic and causes irritation. I cannot stress this enough. Even though this plant can be labor intensive, I still want it in my yard. If you let it go to seed, be careful, it will come up everywhere. Last but not least, are the wonderful penstemmon. I like the Eaton’s penstemmon, called firecracker for very good reason, it’s bright red. There are several colors available. If the bunnies go after your small plants, you can put temporary cages around them until they grow up a bit. I’d like to introduce myself. I am Karen Luksich, a Nevada master gardener and lifelong lover of plants. Gardening is my passion. I’m here to give you tips and ideas on maintaining your property and answer any questions you may have about your yard. I am knowledgeable about irrigation; I worked for the Southern Nevada Water Authority for six years in the Water Smart Landscapes program. As many of you know, this program has given Sun City money to take out grass on the golf courses and also on the softball field up near The Summit. I have volunteered at the Springs Preserve and before that at the Desert Demonstration Garden for 20 years. Garden design has always interested me, and in 2011 I won first place in the Southern Nevada Water Authority Landscape Awards, (but not when I worked there). Since fall is a good time to clean up your yard, it’s time to start thinking of replacing some of your tired plants. Remember, this is the desert and everything has a lifespan. So, if you have some sad looking plants that you would like to replace, there will be a plant sale at the Springs Preserve on Saturday, September 16, from 8 a.m. to 1 p.m. If you’re a member, you can start shopping at 7 a.m. The Springs Preserve is located at 333 S. Valley View Blvd., off US-95 in Las Vegas. The event is a great opportunity to find plants that are natives or desert-adapted. Fall is the best time to plant. Our mild winters give plants a good chance to get established before next summer. Also at the plant sale, there will be master gardeners available to answer questions about proper placement. Always give your new plants room to grow, keep prickly plants away from walkways and enjoy some color in your yard. A foxtail fern at home in India. 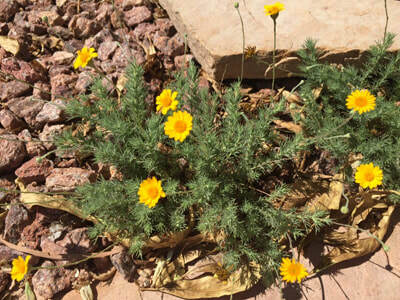 The plant also can be found in pots all over Las Vegas. Photo by Karen Luksich/Link.